I discover a lot of music by watching David Letterman. 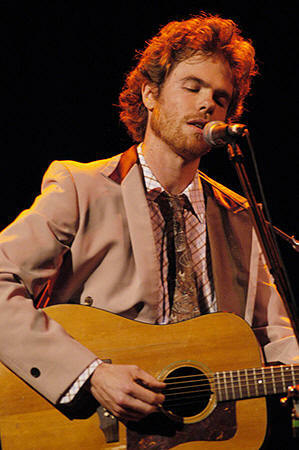 Josh Ritter was on the show about a year ago, and after seeing him perform “To The Dogs or Whoever” I was hooked. Check the video out for yourself. I had never heard of Mr. Ritter at that point and I figured he was a new artist promoting his first album. But I soon found out that the album he was promoting on Letterman was his fifth studio album and was actually a departure from his first four folk-tinged, alt-country-ish albums. The track “Me & Jiggs” is from Golden Age of Radio, his first major release. His eponymous first album was self-released in 2000 (Golden Age was also recorded in 2000 and self-released in 2001. It was re-released in 2002 on the Signature Sounds label). “Me & Jiggs” reminds me of hot summer nights in a wistful, romantic version of the small town where I grew up. The mention of Townes Van Zandt in this song prompted me to start listening to him; TVZ is now one of my favorites. Just try to memorize all the words to “To the Dogs or Whoever.” Go ahead, try it. Wow, that’s a helluva live performance. Good stuff.